Background and objectives: The main treatment goals for degenerative knee osteoarthritis are to relieve pain, restore knee function, improve quality of life, delay knee replacement, and reduce the number of revisions. Knee replacement is currently the most common treatment for degenerative knee osteoarthritis; however, the cost is high, and the procedure is often associated with prosthesis loosening and shedding and many adverse reactions. Therefore, we hypothesize that knee-preserving arthroscopic debridement for treatment of knee degenerative osteoarthritis in elderly patients is lower-cost, effective, safe, and reliable. Design: Prospective, single-center, open-label, non-randomized controlled trial. Methods: In total, 212 elderly patients (knees) with degenerative knee osteoarthritis who receive treatment in the Second Hospital of Chaoyang (Liaoning Province, China) will be included in this study. These patients will be assigned to two groups according to each patient’s condition and wishes (n = 106/group). In the control group, intra-articular injection of sodium hyaluronate will be performed, followed by oral administration of nonsteroidal anti-inflammatory drugs, conventional physiotherapy, and quadriceps functional exercise. In the arthroscopic debridement group, arthroscopic debridement will be performed, followed by oral administration of nonsteroidal anti-inflammatory drugs, conventional physiotherapy, and quadriceps functional exercise. All patients will be followed up at 1 week, 1 month, 3 months, 6 months, 1 year, and 2 years. Outcome measures: The primary outcome measure is the percentage of patients with a Hospital for Special Surgery (HSS) knee score of ≥ 85 points at 2 years after surgery, which will be used to evaluate knee function recovery. The secondary outcome measures are the percentage of patients with an HSS knee score of ≥ 85 points before surgery and at 1 week, 1 month, 3 months, 6 months, and 1 year after surgery; the HSS score, visual analog scale score, Western Ontario and McMaster Universities Osteoarthritis Index, knee range of motion, hospitalization costs, and knee X-ray morphology before surgery and 1 week, 1 month, 3 months, 6 months, 1 year, and 2 years after surgery; medical costs after 2 years of treatment; and incidence of adverse reactions at 1 week, 1 month, 3 months, 6 months, 1 year, and 2 years after surgery. Discussion: The findings from this study will reveal whether arthroscopic debridement for the treatment of degenerative knee osteoarthritis in elderly patients has the advantages of fewer adverse reactions and lower treatment costs with effective restoration of knee function. Ethics and dissemination: This study was approved by Medical Ethics Committee of Second Hospital of Chaoyang of China (approval No. 2017-08-01). The study will be performed in accordance with the Declaration of Helsinki. Participants provided signed informed consent regarding the study protocol prior to participation in the study. This study was designed in June 2017. Patient recruitment and data collection will begin in June 2018. Patient recruitment will end in December 2018. Data analysis will be performed in June 2021. The study will be completed in August 2021. Results will be disseminated through presentations at scientific meetings and/or by publication in a peer-reviewed journal. Trial registration: This trial was registered with the Chinese Clinical Trial Registry (registration number: ChiCTR1800015208). Protocol version (1.0). Elderly patients with degenerative knee osteoarthritis often have degenerative changes in the knee joint, osteophyte formation, and knee pain with quadriceps muscle atrophy, which greatly influence these patients’ quality of life.,,, At present, knee replacement is the most common treatment method for degenerative knee osteoarthritis in elderly patients. However, this method is not suitable for elderly patients because of its high cost and association with prosthesis loosening and shedding and many adverse reactions., The research progress in the treatment of degenerative knee osteoarthritis in elderly patients to date is shown in [Table 1].,, We believe that for elderly patients, better therapeutic effects and improved patient satisfaction can be achieved with knee-preserving treatment, effective restoration of knee function, a decreased incidence of adverse reactions, and reduced medical costs. Arthroscopic surgery is currently performed as a treatment for various knee diseases. Compared with conventional knee replacement, knee-preserving arthroscopic debridement for the treatment of degenerative knee osteoarthritis in elderly patients has the advantages of less trauma, less bleeding, higher efficacy, more rapid recovery, lower cost, fewer complications, and a smaller surgical scar. This study will be performed to investigate the clinical efficacy and incidence of adverse reactions of arthroscopic debridement for the treatment of degenerative knee osteoarthritis in elderly patients through a 2-year follow-up. A prospective, single-center, open-label, non-randomized control trial. Second Hospital of Chaoyang, Liaoning Province, China. Recruitment will be performed through posters on a bulletin board that is used to advertise for patients at the Second Hospital of Chaoyang, Liaoning Province, China. After being informed of the trial objective and procedure, patients interested in participation or their close relatives will provide their names and telephone numbers. Based on the principle of “patient voluntariness,” the investigators will ask the patients or their close relatives to fill in the necessary paperwork according to statutory requirements and procedures. The personal information of all included patients will be kept strictly confidential. A total of 212 patients (knees) with degenerative knee osteoarthritis confirmed by imaging examination and an age of 50 to 70 years will be included in this study. All patients will be recruited from the clinics and wards of the Department of Orthopedics, Second Hospital of Chaoyang, China. A total of 212 patients (knees) will be assigned to 2 groups according to each patient’s condition and wishes (n = 106/group): the control and arthroscopic debridement groups. Randomization, blinding, and allocation concealment will not be used in the grouping. Hospitalization will be needed in the arthroscopic debridement group. Prior to surgery, the presence of surgical contraindications will be excluded by performing routine examinations, including routine blood tests; routine urine tests; measurement of liver function, kidney function, fasting blood glucose, coagulation function, and infectious disease indicators; electrocardiography (echocardiography if necessary); chest and knee X-ray examinations; and measurement of cardiac and lung function. In the control group, outpatient laboratory examinations will be needed to exclude the presence of contraindications to intra-articular injection of sodium hyaluronate. After diagnosis and screening, the patients in the control group will undergo knee joint aspiration and sodium hyaluronate injection once a week for 5 successive weeks. The arthroscope will be introduced through the lateral approach of the tibiofibular ligament. All operations will be performed under arthroscopy. The surgical methods will be determined according to intraoperative exploration. The injured articular cavity will first be cleared, and the dissociated fragments and exfoliated cartilage will then be removed. After removal of synovial tissue, the remaining bone callus will be removed, followed by cartilage repair and subchondral bone microfracture repair. Thereafter, intra-articular injection of sodium hyaluronate will be performed. When the incisions have healed, the sutures will be removed [Figure 1]. 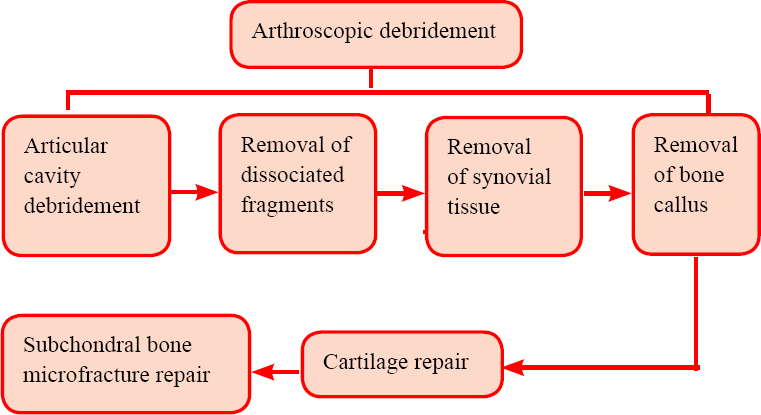 Figure 1: Schematic diagram of arthroscopic debridement. After surgery, oral nonsteroidal anti-inflammatory drugs will be given. Conventional physiotherapy and quadriceps functional exercise therapy will also be performed. The patient voluntarily terminates his or her informed consent to participate in the clinical trial. If severe adverse reactions occur during or after surgery and the investigators find that the risks outweigh the potential benefits, then the hospital ethics committee will consider termination of the study from an ethical perspective. The percentage of patients with an HSS knee score of ≥ 85 points before surgery and at 1 week, 1 month, 3 months, 6 months, and 1 year after surgery. The evaluation criteria will be the same as described above. Hospitalization costs 2 years after surgery. The total treatment costs for patients from admission to discharge will be recorded at the final follow-up 2 years after surgery. Knee HSS score before surgery and at 1 week, 1 month, 3 months, 6 months, 1 year, and 2 years after surgery. The scoring criteria will be the same as described above. Western Ontario and McMaster Universities Osteoarthritis Index (WOMAC) before surgery and at 1 week, 1 month, 3 months, 6 months, 1 year, and 2 years after surgery. The WOMAC consists of three subscales. The overall score for all subscales ranges from 0 to 96 points, with a possible score of 0 to 20 for pain, 0 to 8 for stiffness, and 0 to 68 for physical function. Higher points indicate more severe osteoarthritis. Knee X-ray morphology before surgery and at 1 week, 1 month, 3 months, 6 months, 1 year, and 2 years after surgery. The anteroposterior view of the patient’s affected knee will be taken to determine the recovery of the morphology of the affected knee. Incidence of adverse reactions at 1 week, 1 month, 3 months, 6 months, 1 year, and 2 years after surgery. The incidence of adverse reactions will be calculated as follows: (number of patients with adverse reactions including incision pain, infection, knee joint pain, peripheral nerve injury, and deep vein thrombosis / total number of included patients) × 100%. The scheme of primary and secondary outcome measures is shown in [Table 2]. During the study period, adverse events (including name, start and end time, severity, relationship with known events, and treatment measures) will be accurately recorded. During the follow-up, the start time and type of severe adverse events as well as the treatment measures will be recorded in detail. After occurrence of the adverse event, relevant information will be reported to the principal investigator and the institutional review board within 24 hours. A total of 212 elderly patients (knees) with knee degenerative osteoarthritis will be assigned to two groups. After surgery, all patients will be followed up for 1 week, 1 month, 3 months, 6 months, 1 year and 2 years [Figure 2]. Note: HSS: Hospital for Special Surgery; VAS: Visual Analogue Scale; WOMAC: The Western Ontario and McMaster Universities Osteoarthritis Index.. In accordance with our previous experience, we hypothesized that the percentage of the number of patients with HSS knee score ≥ 85 points at 2 years after surgery in the arthroscopic debridement and control groups would be 80% and 60%, respectively. Assuming β = 0.1, power = 90%, and α = 0.05 (one-sided), a final effective sample size of n = 88 was calculated using the PASS 11.0 software (PASS, Kaysville, UT, USA). Assuming a participant loss rate of 20%, we would require 106 participants per group. Therefore, a total sample size of 212 patients (knees) will be included in this study. All data will be statistically processed using the SPSS 20.0 software (IBM, Armonk, NY, USA) following the intention-to-treat principle. Normally distributed measurement data will be expressed as means and standard deviations. Non-normally distributed data will be expressed as lower quartiles (q1), medians, and upper quartiles (q3). Count data will be expressed as percentages. Pearson chi-square test will be used to compare the percentage of the number of patients with HSS knee score ≥ 85 points and the incidence of adverse reactions between the control and arthroscopic debridement groups. Kruskal-Wallis H test will be used to compare the above indices between different time points in each group. Two-sample t-test (normally distributed data) or Mann-Whitney U test (non-normally distributed data) will be used to compare hospitalization costs, knee HSS score, VAS score, WOMAC and knee range of motion between the two groups. 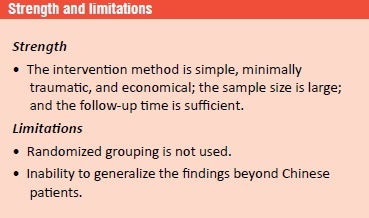 Repeated measures analysis of variance will be used for comparison of the above-mentioned indices between different time points in the same group. An inspection level of α = 0.05 (bilateral) will be considered. Included subjects consist of populations assigned to the full analysis set and per protocol set. Full analysis set: refers to the set of subjects that is as close as possible to the ideal implied by the intention-to-treat principle; specifically, the set of subjects that participate in the treatment and can provide baseline efficacy. For subjects whose follow-up observations may be missing, the last observation will be used. Per protocol set: refers to the set of subjects who meet inclusion and exclusion criteria, complete the study without major protocol deviations, provide effective baseline efficacy and tight enough compliance, and fulfill the case report form. Case report forms will be filled by the investigators accurately, completely, and on time. Written records including demographic information, disease classification, accompanying diseases, and adverse events will be transferred to an electronic format by professional staff using a double data entry strategy. Only the project manager will have the right to inquire about the database, which will be locked by the project manager themselves. All research materials related to this trial will be preserved by the Second Hospital of Chaoyao, China. Research data will be monitored and managed by an Independent Data Monitoring Committee throughout the clinical research process to ensure scientific integrity and rigor, as well as obtain true and complete data. Two staff members will be responsible for transcribing the required information on results. Data will be recorded and checked by investigators and the database will be locked. The role and responsibilities of the Independent Data Monitoring Committee relative to the investigators and ethics committee will be identified. The role and responsibilities of the Independent Data Monitoring Committee will be relative to the project steering committee, statisticians, data managers, inspectors, and sponsors. All surgeons participating in this study have a wealth of orthopedic surgery and arthroscopy experience. The surgery will be performed by orthopedic chief surgeons and senior associated chief surgeons. The monitors will visit the trial institute regularly or according to the actual situation to carry out clinical quality audit work. These visits will be performed to assess two main aspects of the study: (1) The monitors will confirm whether the trial institute is suitable for performing this trial in terms of adequate staffing and training, appropriate examinations, well-equipped laboratories, and good working conditions. (2) During the trial, implementation of the trial protocol will be monitored. Prior to trial commencement, informed consent will be obtained from all patients. The patient enrollment rate and trial progression will be monitored to ensure eligible enrollment. If the clinical trial causes severe adverse reactions or disability to patients, the patients will receive economic compensations for lost work, illness, and/or adverse sequelae. The study design has been approved by the Medical Ethics Committee of Second Hospital of Chaoyang of China (approval No. 2017-08-01). The writing and editing of the article were performed in accordance with the Standard Protocol Item: Recommendations for Interventional Trail (SPIRIT) (Additional file 1 [Additional file 1]). Participants will provide signed informed consent prior to participation in the study. When the investigators discover an unexpected risk in the clinical trial, the investigators and sponsor will jointly modify the content of the informed consent form. After receiving agreement by the medical ethics committee, the affected study participants or their guardians will re-sign the amended informed consent. Results will be disseminated through presentations at scientific meetings and/or by publication in a peer-reviewed journal. Anonymized trial data will be published at www.figshare.com. Protocol design has been just completed at the time of submission. Patient recruitment will begin in June 2018. Knee replacement is currently the most common surgical treatment method for degenerative knee osteoarthritis in elderly patients. Knee prosthesis replacement with good biocompatibility is effective. However, this treatment is often declined by elderly patients with degenerative knee osteoarthritis because of its high cost and the tendency for the prosthesis to loosen and fall off after surgery with the need for revision, leading to adverse reactions. Knee-preserving treatment is recommended for elderly patients with degenerative knee disease. Arthroscopic debridement is simple and minimally invasive, can relieve patient suffering, and save hospitalization costs; therefore, it is a preferred knee-preserving treatment. However, there is a lack of standardized clinical trial data to validate this. Randomized grouping will not be used in this study. A knee replacement group should ideally serve as a control group. The most effective evaluation technique for a curative effect should be further validated. We will not have the ability to generalize the findings beyond Chinese patients. This study will reveal whether arthroscopic debridement for treatment of degenerative knee osteoarthritis in elderly patients produces minimal trauma, alleviates pain, decreases the incidence of adverse reactions, lowers hospitalization costs, and can promote the recovery of knee function. Leung YY, Ma S, Noviani M, et al. Validation of screening questionnaires for evaluation of knee osteoarthritis prevalence in the general population of Singapore. Int J Rheum Dis. 2017. doi: 10.1111/1756-185X.13252. Meehan JP, Monazzam S, Miles T, Danielsen B, White RH. Postoperative stiffness requiring manipulation under anesthesia is significantly reduced after simultaneous versus staged bilateral total knee arthroplasty. J Bone Joint Surg Am. 2017;99:2085-2093. Kontio T, Heliövaara M, Rissanen H, Knekt P, Aromaa A, Solovieva S. Risk factors for first hospitalization due to meniscal lesions - a population-based cohort study with 30 years of follow-up. BMC Musculoskelet Disord. 2017;18:528. Abbasi J. Can exercise prevent knee osteoarthritis? JAMA. 2017;318:2169-2171. Bennell KL, Nelligan R, Dobson F, et al. Effectiveness of an internet-delivered exercise and pain-coping skills training intervention for persons with chronic knee pain: a randomized trial. Ann Intern Med. 2017;166:453-462. Brosseau L, Taki J, Desjardins B, Thevenot O, et al. The Ottawa panel clinical practice guidelines for the management of knee osteoarthritis. Part two: strengthening exercise programs. Clin Rehabil. 2017;31:596-611. Alkatan M, Baker JR, Machin DR, et al. Improved function and reduced pain after swimming and cycling training in patients with osteoarthritis. J Rheumatol. 2016;43:666-672. Peat F, Coomber R, Rana A, Vince A. Vanadium allergy following total knee arthroplasty. BMJ Case Rep. 2018. doi: 10.1136/bcr-2017-222092. Walker T, Zahn N, Bruckner T, et al. Mid-term results of lateral unicondylar mobile bearing knee arthroplasty: a multicentre study of 363 cases. Bone Joint J. 2018;100-B:42-49. Pisanu G, Rosso F, Bertolo C, et al. 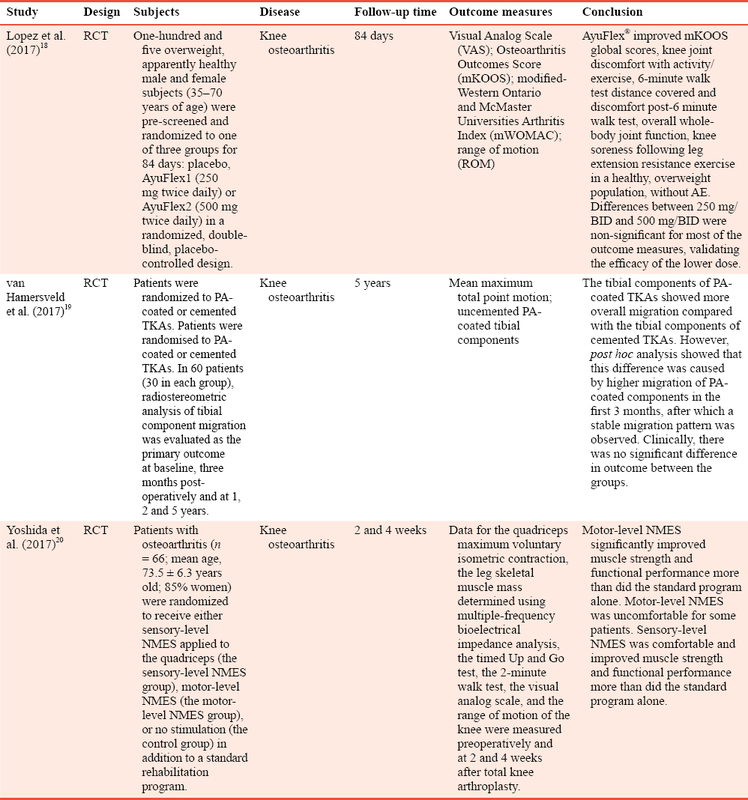 Patellofemoral arthroplasty: current concepts and review of the literature. Joints. 2017;5:237-245. Wang X, Jin X, Blizzard L, et al. Associations between knee effusion-synovitis and joint structural changes in patients with knee osteoarthritis. J Rheumatol. 2017;44:1644-1651. Snelling SJ, Bas S, Puskas GJ, et al. Presence of IL-17 in synovial fluid identifies a potential inflammatory osteoarthritic phenotype. PLoS One. 2017;12:e0175109. Xu HT, Dong JT, Wang J, Gao SJ. Surgical technique of total knee arthroplasty without soft tissue balance. Orthop Surg. 2016;8(4):519-522. Rathbun AM, Yau MS, Shardell M, Stuart EA, Hochberg MC. Depressive symptoms and structural disease progression in knee osteoarthritis: data from the Osteoarthritis Initiative. Clin Rheumatol. 2017;36:155-163. Gower A, Hussein AI, Briggs PJ, Dewar MS. Blood utilization in hip and knee arthroplasty: a cost-minimization study. J R Coll Surg Edinb. 1998;43:397-399. Lazovic D, Carls J, Flöel A, Gratz KF. The value of leukocyte scintigraphy in suspected implant infection in patients with chronic polyarthritis. Chirurg. 1997;68:1181-1186. Lopez HL, Habowski SM, Sandrock JE, et al. Effects of dietary supplementation with a standardized aqueous extract of Terminalia chebula fruit (AyuFlex®) on joint mobility, comfort, and functional capacity in healthy overweight subjects: a randomized placebo-controlled clinical trial. BMC Complement Altern Med. 2017;17:475.
van Hamersveld KT, Marang-van de Mheen PJ, Tsonaka R, Valstar ER, Toksvig-Larsen S. Fixation and clinical outcome of uncemented peri-apatite-coated versus cemented total knee arthroplasty: five-year follow-up of a randomised controlled trial using radiostereometric analysis (RSA). Bone Joint J. 2017;99-B:1467-1476. Yoshida Y, Ikuno K, Shomoto K. Comparison of the effect of sensory-level and conventional motor-level neuromuscular electrical stimulations on quadriceps strength after total knee arthroplasty: a prospective randomized single-blind trial. Arch Phys Med Rehabil. 2017;98:2364-2370. Hochberg MC, Altman RD, Brandt KD, et al. Guidelines for the medical management of osteoarthritis. Osteoarthritis of the knee. American College of Rheumatology. Arthritis Rheum. 1995;38:1535-1546. Kladny B, Albrecht C, Haase I, Swoboda B. Outcome of inpatient rehabilitation following total knee replacement using the HSS-Score. Z Orthop Ihre Grenzgeb. 2002;140:37-41. Kasemsuk T, Saengpetch N, Sibmooh N, Unchern S. Improved WOMAC score following 16-week treatment with bromelain for knee osteoarthritis. Clin Rheumatol. 2016;35:2531-2540. Russo RR, Burn MB, Ismaily SK, et al. How does level and type of experience affect measurement of joint range of motion? J Surg Educ. 2017. doi: 10.1016/j.jsurg.2017.09.009. Protocol design: YCL; patient recruitment: YSX and XYD; data collection and analysis: BB. All authors state that no competing interests exist during study conduction and paper writing. This study will be approved by Medical Ethics Committee, Second Hospital of Chaoyang of China (approval No. 2017-08-01). The study will be performed in accordance with the Declaration of Helsinki and relevant ethical principles. Individual participant data that underlie the results reported in this article, after deidentification (text, tables, figures, and appendices) will be available. Study protocol and informed consent will be available. These data will be available immediately following publication, no end date. Results will be disseminated through presentations at scientific meetings and/or by publication in a peer-reviewed journal. Anonymized trial data will be available indefinitely at www.figshare.com.